Proof of Nephilim Giants – A Huge Compilation! – Coercion Code – "Dark Times are upon us"
Proof of Nephilim Giants – A Huge Compilation! One of the greatest mysteries of the Bible, and also in the World is that there was at one time a race of Giants; the offspring of fallen angels and human beings….. Considering the Bible is clear that giants did exist; then we can assume there would be ample enough evidence to back that up this claim. Below is a list of some of the unusual findings that prove giants are real. Please keep in mind there are literally thousands of these, but I’m only sharing a few…. Skulls have always been a popular subject for scholars and society as a whole and still remain interesting today as if there is always something new to be learned from them. Skulls have been used in religious ceremonies, education, Hollywood culture, folk tales, legends, and much more. One of the popular most recent examples being Indiana Jones and the Crystal Skull, a movie based on infinite knowledge, aliens, magical crystal skulls, and all that other good stuff. Although there has not been anything as far-fetched as these “crystal skulls,” there have been a few bizarre skulls found from across the world that some people question their human origin, and others, its authenticity. In the 1880s during an archaeological dig in Sayre, Bradford County, Pennsylvania a number of human remains were dug up. The skeletons of these artifacts were all anatomically correct for human beings, but they had one odd feature, projections (horns) protruding from the skull above the eyebrow. Sayre is a borough in Bradford County, Pennsylvania USA. The exact year is not clear, but during the 1880s a large burial mound was discovered in Sayre. It was reported that a group of Americans uncovered several strange human skulls and bones. The skeletons belonged to anatomically normal men with the exception of bony projections located about two inches above the eyebrows. 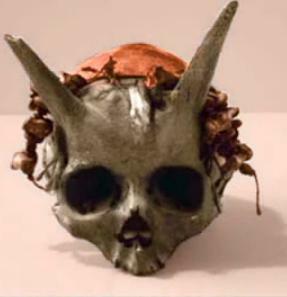 It appeared that the skulls had horns. The bones were characterized as giant, as they were representative of people over seven feet tall. Scientists estimated that the bodies had been buried around A.D. 1200. The archeological discovery was made by a reputable group of antiquarians, including Dr. G.P. Donehoo, the Pennsylvania state dignitary of the Presbyterian Church; A.B. Skinner, of the American Investigating Museum; and W.K.Morehead, of Phillips Academy, Andover, Massachusetts. The fact that they had horns and that they would have been seven feet tall in real life provides people with reason to doubt the “authenticity” of these remains. However, this was not the first time skulls like this were discovered. Similar skulls have been found in Wellsville, New York and El Paso, Texas. 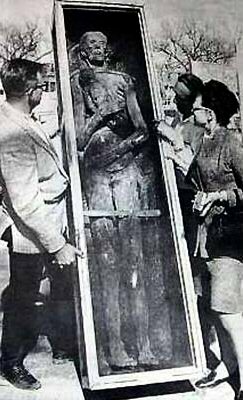 The remains were sent to the American Investigating Museum in Philadelphia, were they were conveniently stolen never to be seen again. The map below is a Google earth map created by researcher Cecelia Hall who has mapped all the giant skeleton reports of “Stone Builders, Mound Builders and the Giants of Ancient America”—a giant skeleton research organization. Worldwide there are over 1,400 and counting and over 1,000 in the U.S. alone. A staggering figure for sure! The mummy remains of a giant have been unearthed in a cave near San Diego, California. It was discovered by a party of prospectors, and was displayed at the Atlantic exposition while, a number of Smithsonian scientists were there. They asked permission to examine it and when consent was given applied their tapes and found that it measured eight feet four inches from crown to heel. The body lied rest in a ten foot coffin. The exhibitor agreed to sell it for $500 to the Smithsonian and it has since been in there care. 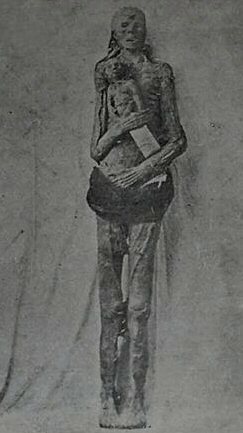 The Martindale Mummies were discovered 1n 1885. In California’s great Yosemite Valley . 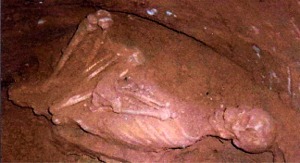 A group of miners led by G.F. Martindale found the remains of a woman nearly seven feet tall still holding a mummified child in a cave behind a wall of rock . These mummies are currently the property of Ripley’s Museum. In the country of Australia anthropologists have unearthed a race of giants, of which they have dubbed the name “meganthropus”. This is not a conspiracy theory, it is a proven fact. These people are very large in size and estimates range between 7 to 12 feet tall. Most people agree that meganthropus, with his mega-tools, was a “man”. Some of the tools found were axes, clubs, pounders, knives, and others ranging in weight from 8 to 36 pounds or more. And while some claim Meganthropus is an ape-human hybrid and an evolutionary being, there is just not enough evidence to back that up. Rather, Meganthropus falls in line with the countless of others skulls that have been unearthed across the globe and match that in likeness to other giant skulls. Next Next post: Malaysian Airlines 370 — Hijacked?